Air Rescue sees you saving hostages from terrorists using a helicopter with a rope ladder. But these are no ordinary hostages, they are world leaders trying to negotiate world peace, but their conference is disrupted when the "evil" League for International Revolution takes them hostage and it's up to you to get them out of there, so no pressure! The game is a rather simplistic affair in that you simply have to negotiate obstacles and fairly slow enemy fire to rescue the hostages. 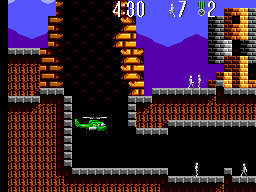 However the skillful element of the game play is manoeuvring the helicopter into a position where you can lower your rope ladder without anything harming you or the hostages as they climb to safety, this can be done either by careful positioning of the chopper or firing on enemies who are in range of your position. 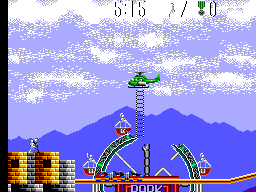 The helicopter itself is shaded in a way that makes it seem almost 3D, as is the scenery to a far lesser extent. Unfortunately the hostages are just plain white, which does make them stand out and easy to spot, but it does mean that they look rather unremarkable. The backgrounds are also far too simplistic, something as simple as a few more colours would have made them really stand out and probably would have given the game a better feel overall, but as it is they let the game down a little. The game's into music is a rather apocalyptical bass line which simply repeats one note as your helicopter rises to it's launch pad, whilst this may sound monotonous it actually adds an air of tension and suspense whilst you prepare. The in game music is actually one of the game's finest features, providing some tunes that are enjoyable whilst making you feel just that little bit on edge. However this area of the game is slightly let down by the poor sound affects as they are just not up to the same standard as the other sound features. The controls are at first mildly irritating, as the helicopter takes time to speed up and has a relatively long breaking distance, which will cause a few people to lose patients early on in the game because people will loose a few lives. If you can get past this though it becomes apparent that the controls are like this to add the element of realism to the game play and the chopper becomes a delight to handle as you weave through tight obstacles with a sense of achievement. Whether you chose to come back to the game is a simple question of enjoyment. There is little incentive to return to Air Rescue once you have completed it. Apart from the fact that the world leaders are hidden in a few different places, which makes very little difference, it just means that certain hostages are easier to get to than others. The other main problem is longevity, the game has 5 levels with each taking about a maximum of 5 minutes, so someone who is used to the game can get through it as little as 15 minutes. Air Rescue is a perfectly enjoyable affair with some very nice features and solid game play. 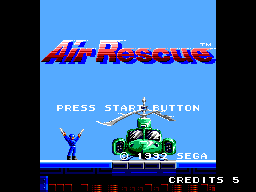 Something as simple as better backgrounds and a few more levels would have made this a standout title for the Master System, but lack of variety coupled with graphics which are less than spectacular are ultimately Air Rescue's undoing.